Many professionals or consultants will charge you up to 300$ per hour for just a simple consultation related to one of the many subjects covered in this guide. 1. Political or economic siituation in your home country makes travel on your current passport difficult. 2. Your assets are the target of litigation or you are burdened by taxation. 3. Your basic human rights or travel is restricted by your citizenship. 4. You are not allowed to work, do business, buy property or land overseas or settle in another country. 5. Your assets, freedom of movement and even life are threatened by your countrys economical or political situation. 6. You are subject to persecution for your religious or political beliefs or for pursuing certain harmless activities. 7. Your current citizesnhip and passport can make you exposed for hijackers and terrorists. 8. Your current passport could be revoked, confiscated or suspended for some reasons. 9. You can be a subject to tax on your worldwide income, currency controls or other confiscation measures. 10. Your state controls, restricts or monitors your travels or private or business activities. 11. Your present passport causes you delays, harassment or denies at any border. 12. You need visas to visit places where you want to go or stay. 13. Your citizenship forces you into unwanted military or other burden obligations. 14. You are identified as a citizen of an unpopular, immoral, aggressive or despotic state. 15. Your passport needs to be renewed or validated frequently. 16. Limited freedom to invest your money when and where you please. 17. You belong to the wrong country, like ex-Yogoslavia, Iraq, Iran, North Korea etc. 18. You cannot invest in the foreign stock markets or offshore mutual funds without restriction or hindrance. 19. You would like to insure a freedom of movement, residence, business of choice for yourself, your dependants etc. 20. You simply would like to open a new opportunities and guarantee a certain freedom and choice for yourself or your dependants. 21. You just would like to have a right for employment in another country which is not available now or perimtion is difficult to obtain. With passport from one of the EU countries you are free to work, live and do business in any of the 27 member states of the European Union - 500 million people market! LEARN WHAT OPTIONS ARE STILL OPEN IN EU! You may qualify to obtain your documents FREE through ethnic background, ancestry or religion in: Brazil, China, Canada, Germany, Ireland, Israel, Italy, Lebanon, Portugal, Spain, Taiwan, Thailand, Turkey, United Kingdom, United States of America etc. Another way is to get an alternative passport by registration, by descent, via marriage or naturalisation. LEARN HOW TO DO IT! In some countries you can be eligible for your 2nd passport in just 6 months after residence application and there is no need to physically spend this time in the country! 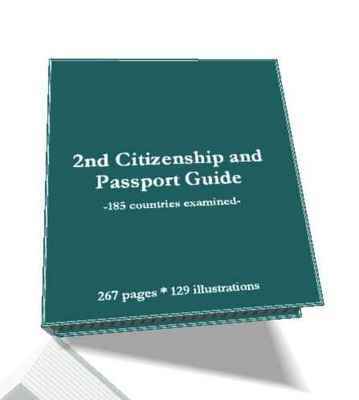 There is an option for a 2nd passport and citizesnhip virtually for everyone who is seriously interested.